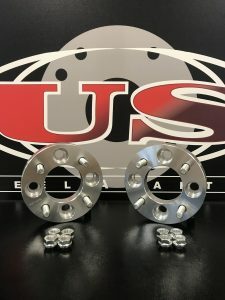 US Wheel adapters offers pre-built 4 lug wheel adapters in lug centric designs only. However 4 lug adapters are available in hub centric style through the custom build page below. All adapters are manufactured using T6061 Billet Aluminum. Please allow up to 7 days for manufacture of custom orders. In stock adapters ship same day if ordered before 2 PM Central Time. Shipped by USPS, allow 2-3 days for delivery. For overnight orders please call our experts at 1-877-823-2787! Use this Bolt Pattern & Hub Centric Guide (Wheel Adapter guide) to gather the info needed to fill out a custom order.